The half-day MJBA Professional Seminar takes place on Thursday, January 21st, 2016,1PM-6PM, at the Red Lion Hotel in Tacoma, WA. Hosted by The Marijuana Business Association and business intelligence firm Front Runner, “Striking Oil” will provide I-502 Producers, Processors, Retailers, and industry professionals with an in-depth look at Washington’s emerging marketplace for cannabis concentrates, oils, edibles and topicals. The legal cannabis marketplace has evolved well beyond the bud, and today Edibles, Topicals, Concentrates and Oils represent the fastest-growing segments for Washington’s legal cannabis industry. 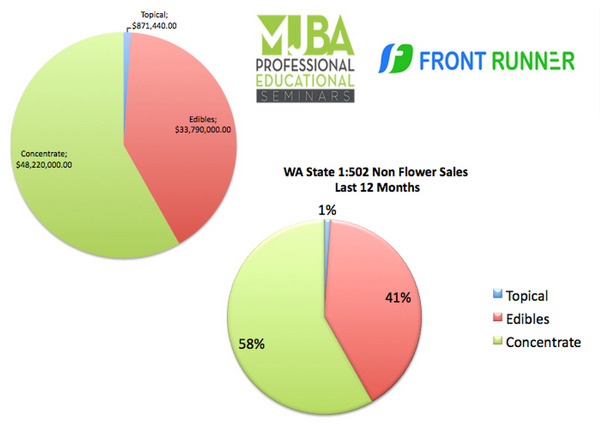 MJBA and Front Runner will kick off the afternoon with a detailed parsing of the LCB sales numbers to date, with forward-looking analysis from Front Runner CEO Brian Yauger. CannaSol Farms founder Jeremy Moberg will deliver the keynote address, providing his prospective as one of the state’s leading Producer/Processors, and an outspoken advocate for naturally-grown cannabis. He will focus his remarks on the needs for Washington producer/processors to self-regulate. Exciting new cannabis-infused products and concentrates bring with them a host of new business challenges for our emerging industry, including how to create best practices and common standards for Contaminants/Pesticides, Dosing and Packaging, and Lab Testing/Quality Assurance. To provide their insights into these pressing issues and others, MJBA has assembled subject matter experts from Washington’s top cannabis companies to serve as our VIP Panelists. Leading subject matter experts from Db3 (Zoots) , Mirth Provisions (Legal) , Eden Labs, Cannabis Basics, Avitas, Kush Creams, Mary’s Medicinals, The Goodship, Ethos Extracts, Robotanical, Spot, Integrity Labs, Landrace Labs, Dama, Amoebic Extracts, (and many others) will lead discussions on Edibles; Topicals, Concentrates and Lab Standards. Tickets are $99 in advance/$125 Day of Show. MJBA Members and Front Runner Subscribers receive special discount! Reserve your tickets here: https://www.eventbrite.com/e/striking-oil-the-business-of-edibles-topicals-and-concentrates-tickets-20114229201? “Striking Oil” VIP Sponsors include Robotanical, Eden Labs, Cannabis Basics, PayQwick, Avitas and Great Pacific Packaging. .